In this chapter we will get familiar with primitive types and variables in C# – what they are and how to work with them. First we will consider the data types – integer types, real types with floating-point, Boolean, character, string and object type. We will continue with the variables, with their characteristics, how to declare them, how they are assigned a value and what is variable initialization. We will get familiar with the two major sets of data types in C# – value types and reference types. Finally we will examine different types of literals and their usage. A typical program uses various values that change during its execution. For example, we create a program that performs some calculations on the values that user enters in. The values entered by one user will obviously be different from those entered in by another user. This means that when creating the program, the programmer does not know all the possible values that will be introduced as input, and that makes it necessary to process all other values entered by different users. When a user enters a new value that will participate in the process of calculation, we can preserve it (temporarily) in the random access memory of our computer. The values in this part of memory change (vary) throughout execution and this has led to their name – variables. Data types are sets (ranges) of values that have similar characteristics. For instance byte type specifies the set of integers in the range [0 … 255]. - Default value – for example 0. - Object type – object. Primitive data types in C# have a direct correspondence with the types of the common type system (CTS) in .NET Framework. For instance, int type in C# corresponds to System.Int32 type in CTS and to Integer type in VB.NET language, while long type in C# corresponds to System.Int64 type in CTS and to Long type in VB.NET language. Due to the common types system (CTS) in .NET Framework there is compatibility between different prog­ramming languages (like for instance, C#, Managed C++, VB.NET and F#). For the same reason int, Int32 and System.Int32 types in C# are actually different aliases for one and the same data type – signed 32-bit integer. Integer types represent integer numbers and are sbyte, byte, short, ushort, int, uint, long and ulong. Let’s examine them one by one. The sbyte type is an 8-bit signed integer. This means that the number of possible values for it is 28, i.e. 256 values altogether, and they can be both, positive and negative. The minimum value that can be stored in sbyte is SByte.MinValue = -128 (-27), and the maximum value is SByte.MaxValue = 127 (27-1). The default value is the number 0. The byte type is an 8-bit unsigned integer type. It also has 256 different integer values (28) that can only be nonnegative. Its default value is the number 0. The minimal taken value is Byte.MinValue = 0, and the maximum is Byte.MaxValue = 255 (28-1). The short type is a 16-bit signed integer. Its minimal value is Int16.MinValue = -32768 (-215), and the maximum is Int16.MaxValue = 32767 (215-1). The default value for short type is the number 0. The ushort type is 16-bit unsigned integer. The minimum value that it can store is UInt16.MinValue = 0, and the minimum value is – UInt16.MaxValue = 65535 (216-1). Its default value is the number 0. The next integer type that we will consider is int. It is a 32-bit signed integer. As we can notice, the growth of bits increases the possible values that a type can store. The default value for int is 0. Its minimal value is Int32.MinValue = -2,147,483,648 (-231), and its maximum value is Int32.MaxValue = 2,147,483,647 (231-1). The int type is the most often used type in programming. Usually programmers use int when they work with integers because this type is natural for the 32-bit microprocessor and is sufficiently "big" for most of the calculations performed in everyday life. The uint type is 32-bit unsigned integer type. Its default value is the number 0u or 0U (the two are equivalent). The 'u' letter indicates that the number is of type uint (otherwise it is understood as int). The minimum value that it can take is UInt32.MinValue = 0, and the maximum value is UInt32.MaxValue = 4,294,967,295 (232-1). The biggest integer type is the ulong type. It is a 64-bit unsigned type, which has as a default value the number 0u, or 0U (the two are equivalent). The suffix 'u' indicates that the number is of type ulong (otherwise it is understood as long). The minimum value that can be recorded in the ulong type is UInt64.MinValue = 0 and the maximum is UInt64.MaxValue = 18,446,744,073,709,551,615 (264-1). You would be able to see declaration and initialization of a variable in detail in sections "Declaring Variables" and "Initialization of Variables" below, and it would become clear from the examples. In the code snippet above, we demonstrate the use of integer types. For small numbers we use byte type, and for very large – ulong. We use unsigned types because all used values are positive numbers. Real types in C# are the real numbers we know from mathematics. They are represented by a floating-point according to the standard IEEE 754 and are float and double. Let’s consider in details these two data types and understand what their similarities and differences are. The first type we will consider is the 32-bit real floating-point type float. It is also known as a single precision real number. Its default value is 0.0f or 0.0F (both are equivalent). The character 'f' when put at the end explicitly indicates that the number is of type float (because by default all real numbers are considered double). More about this special suffix we can read bellow in the "Real Literals" section. The considered type has accuracy up to seven decimal places (the others are lost). For instance, if the number 0.123456789 is represented as type float it will be rounded to 0.1234568. The range of values, which can be hold in a float type (rounded with accuracy of 7 significant decimal digits), is from ±1.5 × 10-45 to ±3.4 × 1038. - Negative infinity -∞ (Single.NegativeInfinity). It is obtained when for instance we are dividing -1.0f by 0.0f. - Positive infinity +∞ (Single.PositiveInfinity). It is obtained when for instance we are dividing 1.0f by 0.0f. - Uncertainty (Single.NaN) – means that an invalid operation is performed on real numbers. It obtains when for example we divide 0.0f by 0.0f, as well as when calculating square root of a negative number. ±5.0 × 10-324 to ±1.7 × 10308. -1.79769313486232e+308 and the largest double value is Double.MaxValue = 1.79769313486232e+308. The closest to 0 positive number of type double is Double.Epsilon ≈ 4.94066e-324. As with the type float the variables of type double can take the special values: Double.PositiveInfinity (+∞), Double.NegativeInfinity (-∞) and Double.NaN (invalid number). In mathematics the real numbers in a given range are countless (as opposed to the integers in that range) as between any two real numbers a and b there are countless other real numbers c where a < c < b. This requires real numbers to be stored in computer memory with a limited accuracy. Since mathematics and physics mostly work with extremely large numbers (positive and negative) and with extremely small numbers (very close to zero) it is required that real types in computing and electronic devices to be stored and processed appropriately. For example, according to the physics the mass of electron is approximately 9.109389*10-31 kilograms and in 1 mole of substance there are approximately 6.02*1023 atoms. Both these values can be stored easily in float and double types. Due to its flexibility the modern floating-point representation of the real numbers provides possibility to work with a maximum number of significant digits for very large numbers (for example, positive and negative numbers with hundreds of digits) and with numbers very close to zero (for example, positive and negative numbers with hundreds of zeros after the decimal point before the first significant digit). The real types in C# we went over – float and double – differ not only by their range of possible values that they can take, but also by their precision (the number of decimal digits, which they can preserve). The first type has a precision of 7 digits, the second – 15-16 digits. We see that the number π which we declared as float, is rounded to the 7-th digit, and the one we declared double – to 15-th digit. The conclusion that we can make is that the real type double retains much greater precision than float and if we need greater precision after the decimal point, we will use it. Real floating-point numbers in C# consist of three components (according to the standard IEEE 754): sign (1 or -1), mantissa and order (exponent), and their value is calculated by a complex formula. More detailed information about the representation of the real numbers is provided in the chapter "Numeral Systems" where we will take an in-depth look at the representation of numbers and other data types in computing. The reason for the unexpected result in the first example is the fact that the number 0.1 (i.e. 1/10) has no accurate representation in the real floating-point number format IEEE 754 and its approximate value is recorded. When printed directly the result looks correct because of the rounding, which is done when converting the number to string to be printed on the console. When switching from float to double the approximate representation of the number in the IEEE 754 format is more noticeable. Therefore, the rounding does no longer hide the incorrect representation and we can observe the errors in it after the eighth digit. Both examples show that floating-point number arithmetic can produce mistakes, and is therefore not appropriate for precise financial calculations. Fortunately, C# supports decimal precision arithmetic where numbers like 0.1 are presented in the memory without rounding. Not all real numbers have accurate representation in float and double types. For example, the number 0.1 is represented rounded in float type as 0.099999994. C# supports the so-called decimal floating-point arithmetic, where the numbers are presented in the decimal numeral system rather than the binary one. Thus, the decimal floating point-arithmetic type in C# does not lose accuracy when storing and processing floating-point numbers. The type of data for real numbers with decimal precision in C# is the 128-bit type decimal. It has a precision from 28 to 29 decimal places. Its minimal value is -7.9×1028 its maximum value is +7.9×1028. The default value is 0.0m or 0.0M. The 'm' character at the end indicates explicitly that the number is of type decimal (because by default all real numbers are of type double). The closest to 0 numbers, which can be recorded in decimal, are ±1.0 × 10-28. It is obvious that decimal can store neither very big positive or negative numbers (for example, with hundreds of digits), nor values very close to 0. However, this type is almost perfect for financial calculations because it represents the numbers as a sum of powers of 10 and loses from rounding are much smaller than when using binary representation. The real numbers of type decimal are extremely convenient for financial calculations – calculation of revenues, duties, taxes, interests, payments, etc. The number decimalPI, which we declared of type decimal, is not rounded even with a single position because we put it with precision of 21 digits, which fits in the type decimal without being rounded. Because of the very high precision and absence of anomalies during calculations (which exist for float and double), the decimal type is extremely proper for financial calculations where accuracy is critical. Despite its smaller range, the decimal type retains precision for all decimal numbers, which it can store! This makes it much more suitable for precise calculations, and very appropriate for financial ones. The main difference between real floating-point numbers and real numbers with decimal precision is the accuracy of calculations and the extent to which they round up the stored values. The double type allows working with very large values and values very close to zero but at the expense of accuracy and some unpleasant rounding errors. The decimal type has smaller range but ensures greater accuracy in computation as well as absence of anomalies with the decimal numbers. If you perform calculations with money use the decimal type instead of float or double. Otherwise, you may encounter unpleasant anomalies while calculating and errors as a result! As all calculations with data of type decimal are done completely by software, rather than directly at a low microprocessor level, the calculations of this type are from several tens to hundreds of times slower than the same calculations with double, so use this type only when it is really necessary. Boolean type is declared with the keyword bool. It has two possible values: true and false. Its default value is false. It is used most often to store the calculation result of logical expressions. In the example above, we declare two variables of type int, compare them and assign the result to the Boolean variable greaterAB. Similarly, we do so for the variable equalA1. If the variable greaterAB is true, then A > B is printed on the console, otherwise A <= B is printed. Character type is a single character (16-bit number of a Unicode table character). It is declared in C# with the keyword char. The Unicode table is a technological standard that represents any character (letter, punctuation, etc.) from all human languages as writing systems (all languages and alphabets) with an integer or a sequence of integers. More about the Unicode table can be found in the chapter "Strings and Text Processing". The smallest possible value of a char variable is 0, and the largest one is 65535. The values of type char are letters or other characters, and are enclosed in apostrophes. Strings are sequences of characters. In C# they are declared by the keyword string. Their default value is null. Strings are enclosed in quotation marks. Various text-processing operations can be performed using strings: concatenation (joining one string with another), splitting by a given separator, searching, replacement of characters and others. More information about text processing can be found in the chapter "Strings and Text Processing" in which there is detailed explanation on what a string is, what its applications are and how we can use it. // Your full name is John Smith. Object type is a special type, which is the parent of all other types in .NET Framework. Declared with the keyword object, it can take values from any other type. It is a reference type i.e. index (address) of a memory area which stores the actual value. As you can see from the example in object type variable, we can store the value of any other type. This makes the object type a universal data container. Nullable types are specific wrappers around the value types (as int, double and bool) that allow storing the null value in them. This provides opportunity for types that generally do not allow lack of value (i.e. value null) to be used as reference types and to accept both normal values and the special one null. Thus nullable types hold an optional value. Both declarations are equivalent. The easiest way is to add a question mark (?) after the type, for example int?, the more difficult is to use the Nullable<…> syntax. The example above shows how a nullable variable (int?) can have a value directly added even if the value is non-nullable (int) but the opposite is not directly possible. For this purpose, the nullable types’ property Value can be used. It returns the value stored in the nullable type variable, or produces an error (InvalidOperationException) during program execution if the value is missing (null). In order to check if a variable of nullable type has a value assigned, we can use the Boolean property HasValue. Another useful method is GetValueOrDefault(). If the nullable type variable has a value, this method will return its value, else it will return the default value for the nullable type (most commonly 0). After reviewing the main data types in C# let’s see how and for what we can use them. In order to work with data we should use variables. We have already seen their usage in the examples, but now let’s look at them in more details. - modifying the stored information. In C# programming, you will use variables to store and process information all the time. - value (stored information), for example 25. A variable is a named area of memory, which stores a value from a particular data type, and that area of memory is accessible in the program by its name. 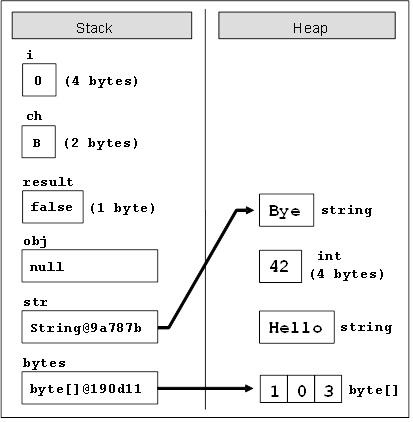 Variables can be stored directly in the operational memory of the program (in the stack) or in the dynamic memory in which larger objects are stored (such as character strings and arrays). Primitive data types (numbers, char, bool) are called value types because they store directly their value in the program stack. Reference data types (such as strings, objects and arrays) are an address, pointing to the dynamic memory where their value is stored. They can be dynamically allocated and released i.e. their size is not fixed in advance contrary to the case of value types. More information about the value and reference data types is provided in the section "Value and Reference Types". When we want the compiler to allocate a memory area for some information which is used in our program we must provide a name for it. It works like an identifier and allows referring to the relevant memory area. - Variable names can contain the letters a-z, A-Z, the digits 0-9 as well as the character '_'. - Variable names cannot start with a digit. - Variable names cannot coincide with a keyword of the C# language. For example, base, char, default, int, object, this, null and many others cannot be used as variable names. A list of the C# keywords can be found in the section "Keywords" in chapter "Introduction to Programming". If we want to name a variable like a keyword, we can prefix the name with "@". For example @char and @null are valid variable names while char and null are invalid. We will provide some recommendations for naming as not all allowed by the compiler names are appropriate for our variables. - The names should be descriptive and explain what the variable is used for. For example, an appropriate name for a variable storing a person’s name is personName and inappropriate name is a37. - Only Latin characters should be used. Although Cyrillic is allowed by the compiler, it is not a good practice to use it in variable names or in the rest of the identifiers within the program. - In C# it is generally accepted that variable names should start with a small letter and include small letters, such as each word in them starts with a capital letter. For instance, the name firstName is correct and better to use than firstname or first_name. Usage of the character _ in the variable names is considered a bad naming style. - Variable names should be neither too long nor too short – they just need to clarify the purpose of the variable within its context. - Uppercase and lowercase letters should be used carefully as C# distinguishes them. For instance, age and Age are different variables. Variables should have names, which briefly explain their purpose. When a variable is named with an inappropriate name, it makes the program very difficult to read and modify later (after a while when we have forgotten how it works). For further elaboration on the proper naming of variables refer to chapter "High-Quality Programming Code". Always strive for naming the variables with short but clear enough names. Follow the rule that the variable name should make clear for what it is used, e.g. the name should answer the question "what value is stored in this variable". If this is not fulfilled then try to find a better name. Digits are not appropriate to be used in variable names. - optionally specify initial value (such as 25) but this is not obligatory. Assigning a value to a variable is the act of providing a value to be stored in it. This operation is performed by the assignment operator "=". On the left side of the operator is the variable name and on the right side – its new value. The word initialization in programming means specifying an initial value. When setting value to variables at the time of their declaration we actually initialize them. Data types in C# are two types: value and reference. Value types are stored in the program execution stack and directly contain their value. Value types are the primitive numeric types, the character type and the Boolean type: sbyte, byte, short, ushort, int, long, ulong, float, double, decimal, char, bool. The memory allocated for them is released when the program exits their range, i.e. when the block of code in which they are defined completes its execution. For example, a variable declared in the method Main() of the program is stored in the stack until the program completes execution of this method, i.e. until it completes (C# programs terminate after fully executing the Main() method). 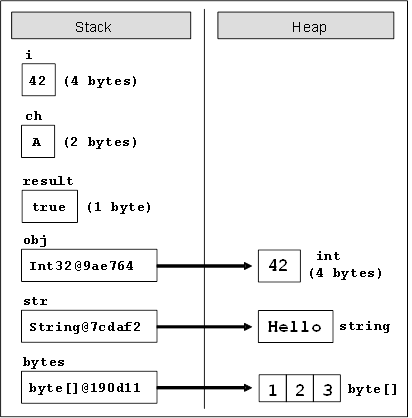 Reference types keep a reference (address), in the program execution stack, and that reference points to the dynamic memory (heap), where their value is stored. The reference is a pointer (address of the memory cell) indicating the actual location of the value in the heap. An example of a value at address in the stack for execution is 0x00AD4934. The reference has a type and objects it points to have to be of this type, i.e. it is a strongly typed pointer. All reference types can get value null. This is a special service value, which means that there is no value. Reference types allocate dynamic memory for their creation and release such at some time by the system for memory cleaning (garbage collector) when it finds that they are no longer used by the program. It is unknown exactly when a given reference variable will be released of the garbage collector as this depends on the memory load and other factors. Since the allocation and release of memory is a slow operation, it can be said that the reference types are slower than the value ones. As reference data types are allocated and released dynamically during program execution, their size might not be known in advance. For example, a variable of type string can contain text data of varying length. Actually the string text value is stored in dynamic memory and can occupy a different volume (count of bytes) while the string variable stores the address of the text value. Reference types are all classes, arrays and interfaces such as the types: object, string, byte. We will learn about classes, objects, strings, arrays and interfaces in the next chapters of this book. For now, it is enough to know that all types, which are not value, are reference and their values are stored in the heap (the dynamically allocated memory). As you can see from the figure, a change in a value type (i = 0) changes its value directly into the stack. When changing a reference type things are different: the value is changed in the heap (bytes = 0). The variable that keeps the array reference remains unchanged (0x00190D11). When assigning a null value in a reference type, that reference is disconnected from its value and the variable remains with no value (obj = null). When assigning new value to an object (a reference type variable) the new object is allocated in the heap (the dynamic memory) while the old object remains free (unreferenced). The reference is redirected to the new object (str = "Bye") while the old objects ("Hello") will be cleaned at some moment by the Garbage Collector (the .NET Framework’s internal system for automatic memory cleaning) as they are not in use anymore. In the above example, literals are true, 'C', 100, 20000 and 300000. They are variable values set directly in the source code of the program. When we assign a value to a variable of type bool we can use only one of these two values or a Boolean expression (which is calculated to true or false). - 'l' and 'L' as suffix indicates long type data, for example 357L. - 'u' and 'U' as suffix indicates uint or ulong data type, for example 112u. By default (if no suffix is used) the integer literals are of type int. - 'e' is an exponent, for example, "e-5" means the integer part multiplied by 10-5. By default (if there is no suffix), the real numbers are of type double. Sometimes it is necessary to work with characters that are not displayed on the keyboard or with characters that have special meanings, such as the “new line” character. They cannot be represented directly in the source code of the program and in order to use them we need special techniques, which we will discuss now. Escaping sequences are special literals – a sequence of special characters, which describe a character, which for some reason cannot be written directly in source code. This is for instance the “new line” character. - \uXXXX – char specified by its Unicode number, for example \u03A7. The character \ (backslash) is also called an escaping character because it allows the display on screen (or other output device) of characters that have special meaning or effect and cannot be represented directly in the source code. String literals are used for data of type string. They are a sequence of characters enclosed in double quotation marks. All the escaping rules for the char type discussed above are also valid for string literals. Strings can be preceded by the @ character that specifies a quoted string (verbatim string). In quoted strings the rules for escaping are not valid, i.e. the character \ means \ and is not an escaping character. Only one character needs to be escaped in the quoted strings – the character " (double-quotes) and it is escaped in the following way – by repeating it "" (double double-quotes). All other characters are treated literally, even the new line. Quoted strings are often used for the file system paths naming. More about strings we will find in the chapter "Strings and Text Processing". 1. Declare several variables by selecting for each one of them the most appropriate of the types sbyte, byte, short, ushort, int, uint, long and ulong in order to assign them the following values: 52,130; -115; 4825932; 97; -10000; 20000; 224; 970,700,000; 112; -44; -1,000,000; 1990; 123456789123456789. 2. Which of the following values can be assigned to variables of type float, double and decimal: 5, -5.01, 34.567839023; 12.345; 8923.1234857; 3456.091124875956542151256683467? 3. Write a program, which compares correctly two real numbers with accuracy at least 0.000001.
hexadecimal format (256 is 100 in a numeral system with base 16). 5. Declare a variable of type char and assign as a value the character, which has Unicode code, 72 (use the Windows calculator in order to find hexadecimal representation of 72). 6. Declare a variable isMale of type bool and assign a value to it depending on your gender. 7. Declare two variables of type string with values "Hello" and "World". Declare a variable of type object. Assign to this variable the value obtained of concatenation of the two string variables (add space if necessary). Print the variable of type object. 8. Declare two variables of type string and assign them values "Hello" and "World". Declare a variable of type object and assign to it the value obtained of concatenation of the two variables of type string (do not miss the space in the middle). Declare a third variable of type string and initialize it with the value of the variable of type object (you should use type casting). 9. Declare two variables of type string and assign them a value “The "use" of quotations causes difficulties.” (without the outer quotes). In one of the variables use quoted string and in the other do not use it. 10. Write a program to print a figure in the shape of a heart by the sign "o". 11. Write a program that prints on the console isosceles triangle which sides consist of the copyright character "©". 12. A company dealing with marketing wants to keep a data record of its employees. Each record should have the following characteristic – first name, last name, age, gender (‘m’ or ‘f’) and unique employee number (27560000 to 27569999). Declare appropriate variables needed to maintain the information for an employee by using the appropriate data types and attribute names. 13. Declare two variables of type int. Assign to them values 5 and 10 respectively. Exchange (swap) their values and print them. 1. Look at the ranges of the numerical types in C# described in this chapter. 2. Consider the number of digits after the decimal point. Refer to the table with sizes of the types float, double and decimal. 4. Look at the section about Integer Literals. To easily convert numbers to a different numeral system use the built-in Windows calculator. For a hexadecimal representation of the literal use prefix 0x. 5. Look at the section about Character Literals. 6. Look at the section about Boolean Literals. 7. Look at the sections about Strings and Object Data Type. 9. Look at the section about Character Literals. It is necessary to use the escaping character \" or verbatim strings. 10. Use Console.WriteLine(…), the character 'o' and spaces. 11. Use Console.WriteLine(…), the character © and spaces. Use Windows Character Map in order to find the Unicode code of the sign "©". You may need to change the font of your console to some font that supports the “©” symbol, e.g. “Consolas” or “Lucida Console”. 12. For the names use type string, for the gender use type char (only one char m/f), and for the unique number and age use some integer type. Download the demo examples for this chapter from the book: Primitive-Types-and-Variables-Demos.zip. terminu płatności – wobec dotychczasowych 180 dni. the fiber as well as vitamins that are essential for the baby’s development. Bamboo tableware and accessories are becoming vital part of catering arrangement nowadays. more inviting and pleasing to the eyes. definitely will come back later in life. I want to encourage one to continue your great posts, have a nice afternoon! Thanks for wonderful write-up. I enjoyed it. Very well organized. Nullable types are reference types i.e. they are reference to an object in the dynamic memory, which contains their actual value.==> wrong statement. Nullable is a Struct. Please check MSDN. Nullable types are instances of the System.Nullable struct.